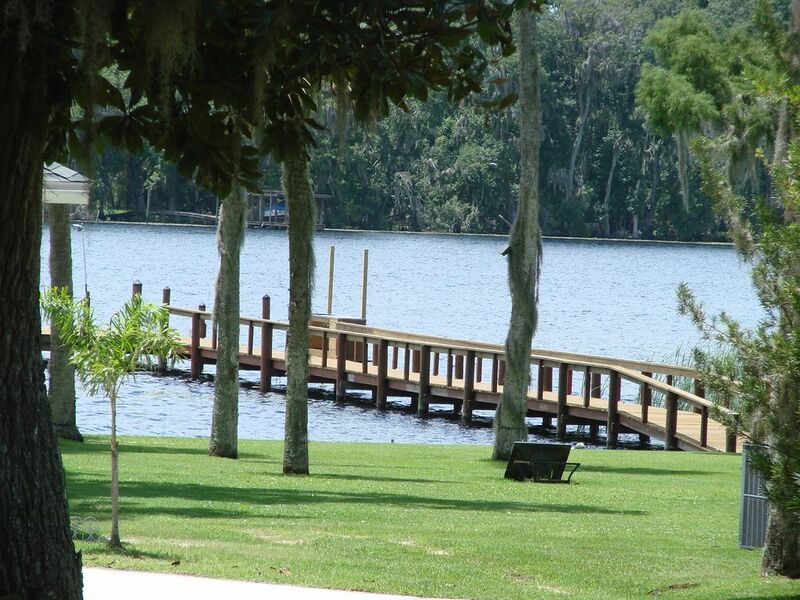 Our home boasts a view of the most beautiful part of the St Johns River and Drayton Island. Dock is available for access to your boat and the river. The convenient boat ramp is 200 yards away. The property is well maintained, secure, uncrowded and very quiet, You will see egrets, eagles, osprey, manatee, turkeys and much more. The property is close to 3 springs by water and Lake George. Fishing and boating are ideal from this spot. You will see boats of all sizes pass in the channel out front. The home is comfortable and well kept with wood floors throughout and carpet in the MBR. Open floor plan and high ceiling provides a comfortable environment inside and the large screened front porch provides a view of the river and plenty of seating. There are restaurants, bars and general store within a mile. The Georgetown Marina, 1/2 mile away sells gas, bait, ice and misc items. The property is open and uncongested. It is well kept and beautiful. Extremely quiet and peaceful. The location is convenient to local restaurants/bars and Dollar General. House has excellent view of river and Drayton Island. River and private dock is 200 feet from rental. Boat ramp is 200 yards away. Full access to private dock with rental. General property is waterfront but this rental is located 200 feet from water with great view of river. Owners were very nice and helpful to anything we had questions about. Went for a fishing trip, dock was perfect to leave the boat docked up. House was nice, clean, and met all our needs. Will definitely visit again. We enjoyed our stay. The setting was indeed very peaceful. We could walk to the dock in front of the owner's house or to the boat launch just a block away to view the sunset and the water. The house was very clean, spacious, and had everything we needed. There were a couple restaurants within 2-8 miles away. The owners were very pleasant and and immediately helpful on the only issue we had (lamp not working). If you came with a boat it would be very easy to put in at the boat launch and there's plenty of room to turn around with a trailer. The week we stayed it was too cold and rainy for boating for us. Plenty of room around the house for our dog to play. Hiking trail in Welaka State Forest 8 miles away. Great place to fish or for boating on lake and river. The property is not directly on the water as implied in the picture, but sits behind the owner's property, where you have dock access. View pictured is from his dock and not the rental property. That said, there is nice dock hook-up for a personal boat and ample parking for trailer. House is a mobile home and quite nice. Beds were great and very clean inside. Dock is a short walk downhill. Enjoyed our stay, peaceful location, and good fishing. Owner was on site and very helpful with anything we needed. The place is not as the photos look. Place was disgustingly filthy. Dead bugs in the drawers, dirty pots and pans in the oven, coffee pot was so gross I wouldn't even touch it. We bought a new one. The pots and pans were dirty as were most of the dishes taken out of the cabinets. Microwave had about an inch of crud on the inside top. The place smelled so bad with musty and mildew and I don't know what else. My clothes started to take on the smell. We found a dehumidifier that we turned on and that did help. The owner never told us about it. I sprayed everything down with disinfectant, my husband cleaned the drawers as well as both bathrooms. The wooden steps leading up to the trailer were so rotted we were afraid of them. I just knew one of us could fall through any time. One night my husband locked the door using the door knob. Well the key given to us didn't work on that lock. When we called the owner about it he said no I don't have a key to the door handle. Never told us that though. The view is a tiny sliver of river. Didn't matter, many windows were broken and dirty. At the time we booked there were no reviews. Lesson learned. I know several others stayed there after us. We left the place much cleaner than when we got there. I’m very disappointed in this review. It is simply not true. We take pride in the cleanliness of the rental and go to extremes to make sure it is spotless for each new guest. We typically have reviews raving about the cleanliness of the home. This guest did not read the information and was surprised that the unit was not directly on the water. It is 200’ away. I gladly allowed cancellation of the 2nd 1/2 of their reservation with no fees or concern. We don’t ever want to have a guest with a bad experience. We did have a lock issue but that was resolved quickly. Enjoyed our stay at the VRBO River House, was a great retreat from the busy world we live in. The house was clean and very well furnished. The sunsets were awesome. View from the dock was great. A bonus was the full moon & one could observe the moonlight without any artificial or commercial lighting. Really liked the outdoor atmosphere of "Old Florida" with the large oak & palm trees with the moss - reminded me of the historic scenes from Gone With The Wind & other Southern plantation visits. I always stay in pet friendly accommodations as I always take my dog. He enjoyed playing & running thru the lush green grass & playing Frisbee, etc. also many great places for walks. Home was very pet friendly & the flooring was designed for pets with the laminate floors - so no issues there for pets & guests. I was indeed surprised by how well the house & kitchen was furnished, as I have stayed at other VRBO & Airbub locations & they were not as homey & every attention to detail wasn't in any way like the River House was. Indeed it was just like being in your own home, furnished in detail and the kitchen & baths were just like being your own home. The screened porch was a very awesome place to relax & read, also have morning coffee or chocolate and view the river. If you are searching for a peaceful & quiet getaway, the Peaceful Paradise is your best choice. I understand the fishing & boating opportunities on the river are abundant - but our goal was to unplug from the "other world" during our visit & enjoy nature. A bonus was observing the various wildlife species in such a serene setting. Would rate the Peaceful Paradise a 10 no qualms. Looking forward to a future booking. Am always a picky person when staying away from home & this house was immaculately clean & well represented by the photos. No disappointments. The owner was always available to answer any questions. Wi-Fi internet was very dependable but depending on the cell carrier my Verizon phone was always reliable with service, however the AT&T phone was sketchy for cell service.